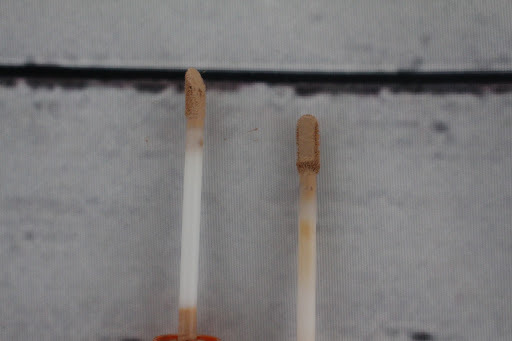 Hi guys, today I’m joining you with a drugstore vs high end post and I will be comparing the Rimmel wake me up concealer and the Naked skin concealer. I was thinking about making this into a little series where I try and find the best dupes for high end products and say whether I think you should save or splurge. Let me know what you think of that idea! First off I will start with what you see first, the packaging. The Rimmel wake me up has pretty good packaging for the drugstore. Featuring the iconic orange of the wake me up collection and almost “radiant” text matching the radiant glow the product promises. The Naked skin concealer, quite rightly, is an expensive feeling and looking product which matches the expensive price tag. It is minimalistic yet chic and I love how the lid clicks in place so you know the lid is on properly to prevent your product from drying out. Next I am going to talk about the formula, they have very different consistencies but I like them both a lot. The Rimmel wake me up is much thinner than the Naked skin which I find can often look a bit cakey. The Rimmel wake me up is extremely brightening but not full coverage like it claims to be, whilst the Naked skin does have really good coverage, allowing it to double up for spots as well as under the eyes. The applicators are very different but again I like them both a lot. The Rimmel wand is domed so allows you to swoop nicely under your eyes depositing the right amount of product. The Naked wand is more precise but applies far too much product even after scraping what I think is most off. 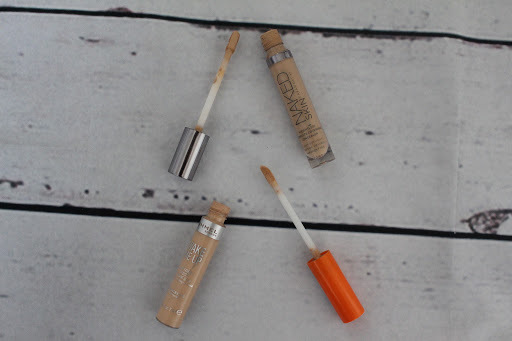 The colour I have in the Naked skin (light neutral) was recommended to me on the Urban Decay concession but I personally would have gone for the lightest shade (fair neutral) as I like a super highlighting concealer. However light neutral is wearable for me and it isn’t too yellow or too pink, it just sits nicely in the middle of all the undertones. I have the lightest shade of the wake me up concealer and I love it as it highlights so much on the high points of my face. It definitely has a pink undertone to it but as colour correcting has taken over the beauty industry by storm we know pink is used under our eyes to brighten. Overall I would say… SAVE! The Rimmel wake me up is such an incredible concealer, as is the Naked skin, but I don’t think the difference in price is worth it compared to the difference in quality. Have you tried either of these concealers, if so would you say save or splurge?